It's a bitter sweet moment when you pick up your boats knowing that the forthcoming trip will be the last of the season. You will have gathered that this spring's blacking turned out to be something of a disaster so we reluctantly booked the motor in for some more treatment, this time at the dry dock in Hockley Port which happened to be free for the week following Parkhead. The motor was left high and dry on Monday and, with the water drained away, the extent of the damage was apparent. Huge swathes of blacking has come off and the decision to return it to dry dock was absolutely the right one. 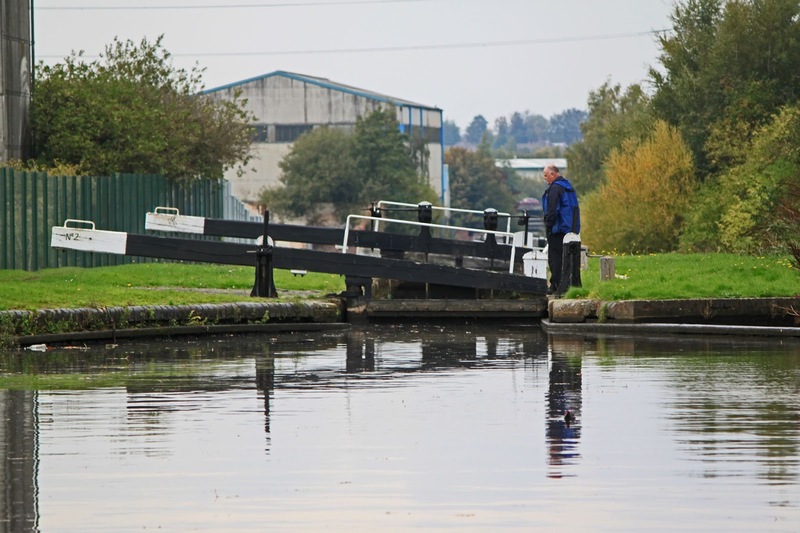 The butty was also left at Hockley Port, locked up on the visitor moorings. To be honest, I was more concerned about the butty than the motor but we returned to find it just as we had left it. The dry dock was refilled on Friday morning and we took it in turns to winch up the guillotine gate, which was incredibly stiff. 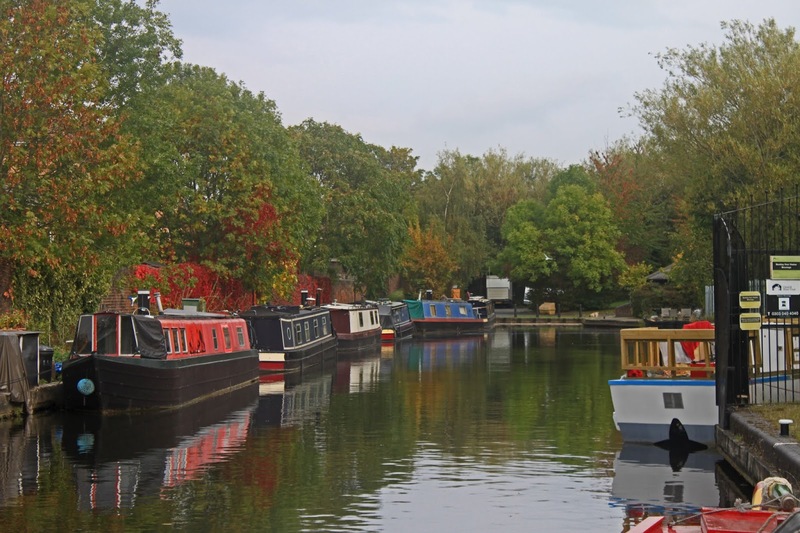 I settled my dues with Sherborne Wharf and took comfort from the positive comments made about the condition of the hull, which is nearing 20 years old. I was accompanied by Mr Whateley, my ever supportive relief crew member and having hooked the butty on the back we set off. Hockley Port is one of those secretive little pockets of the BCN which I have only ever visited once before. Its off the little used Soho Loop and was originally the entrance to Matthew Bolton's Soho Works, manufacturers of many steam engines. 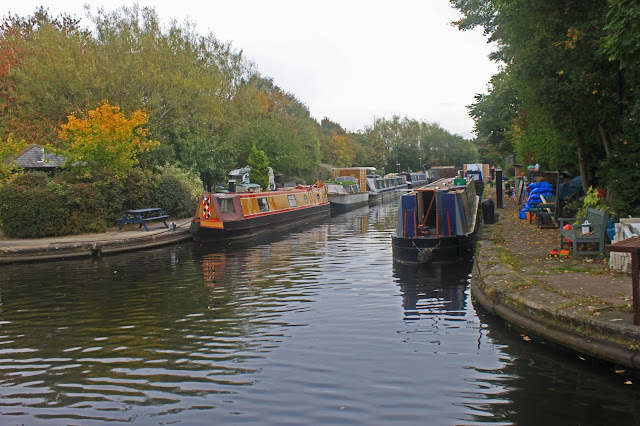 The extension to the works at the end of the basin is long gone but the two broad railway transhipment arms have been cleaned out and now support a thriving residential boating community. Its the presence of the community that gives me pause for thought before entering through the low arch as it feels like an unnecessary intrusion unless visiting the dry dock. (£10 a foot for pressure washing and 3 coats of blacking). 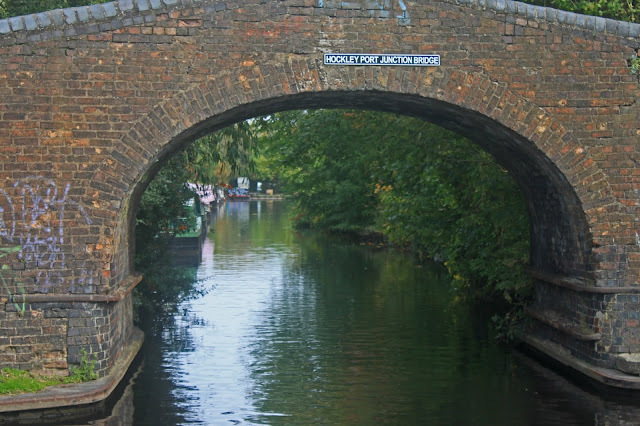 We were soon back on the New Mainline and, with company on the back of the boat the miles flew past, we were soon at Pudding Green Junction, gateway to the northern reaches of the BCN. The canal immediately becomes narrow and weedy with offside vegitation nearly covering the channel. 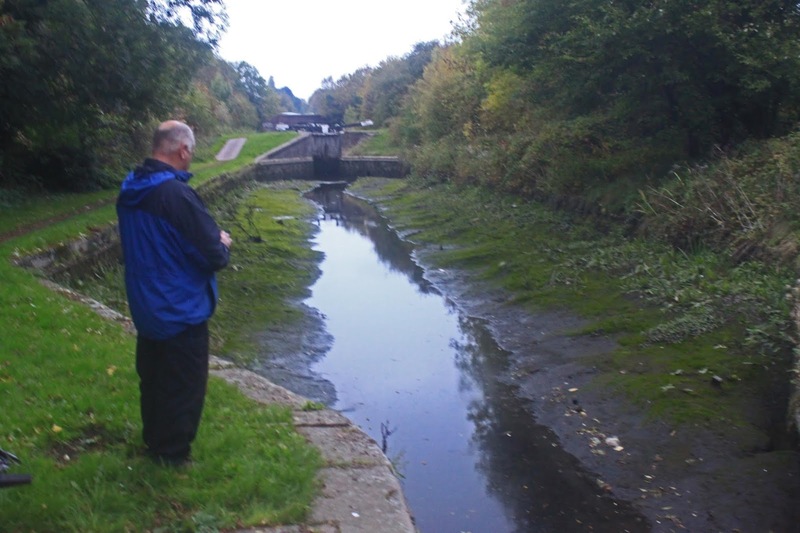 Then there is the murky entrance to the Wednesbury Old Canal (not a place to venture) before setting too on the eight locks of the Ryders Green Flight. Ray and Lesley on Morgana had been through just before us so it was no surprise to find them all empty. What we did notice was the large amount of debris which had been hauled from behind the lock gates. I later discovered that Raleigh has been through the day before and as an original BCN day boat with a beam of 7ft plus they had struggled, taking 2.5 hours over the last couple of locks. Their efforts were to our advantage and we were down by 4.00pm. The plan was to stop for the night at Ocker Hill, but as the evening was lovely and the forecast foul we decided to press on, eventually reaching the bottom of the Rushall Flight (aka The Ganzies) where we ran out of both light and water. We know from long experience that the bottom pound is problematic and, as usual, it was completely empty with grass growing from the bed. 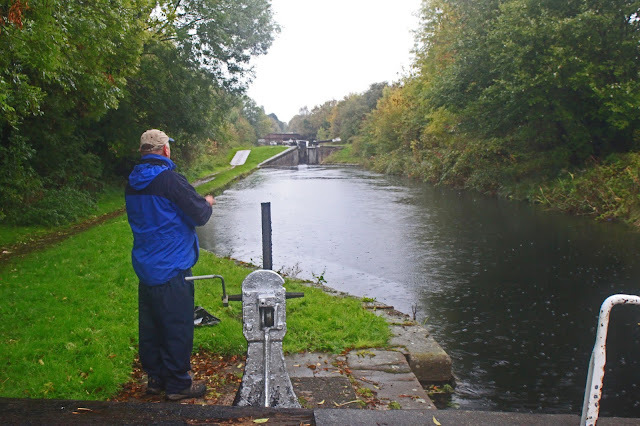 The problem here is that all the pounds are short and getting enough water to make it up the next seven locks can be a long and tedious business of running water down. But we had a cunning plan which involved friends in high places. Martin was on his boat at Longwood Boat Club so he happily agreed to lift half a paddle in the evening and by first light at 7.00am I peered out of the window and sure enough, there was a flow on the canal and the by wash was bubbling away. Loads of wet stuff after running half a paddle all night! The temperature had also fallen to 6.5c and a steady rain has set in driven by a northerly wind, so we wrapped up well and set to work on the nine locks and three miles which separated us from home. With water running over all the weirs the canal was at maximum depth and we fairly flew up the hill, making light of the usually challenging mile pound. To be honest, the depth was so far up I was a bit worried about overtopping in places. And so we passed through Rushall Top Lock (aka The Moshes) and emptied the boats, shutting them down for the winter. The boats may not be moving again before next April but that is far from the end of our canal interest. I have big plans to revisit the lost 60 miles as soon as the vegetation dies down, but more of that another time.